Do we Irish just sit and wait while our inept politicians encourage the next meat scandal. Another Supposed Irish meat scandal, that sadly RTE and too many of the Irish public did not even question as to the origin. 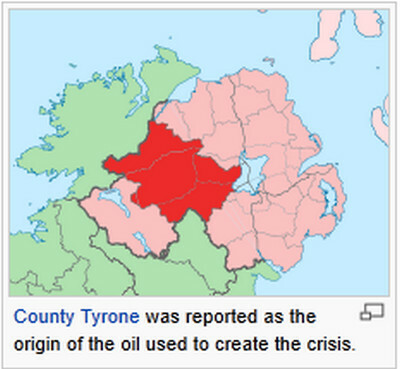 Wikipedia still label it the "2008 Irish pork crisis"
Is not NI a long time British province? Of course Westminster crown had no legitimacy or original democracy and only did so via the real use or real threat of their military and state terrorism, never the less, does not the Crown of Westminster claim authority on that part of Ireland. Is not NI still a British province, be it now only a provisional province because of the details in the peace agreement. It is at best a shared province, Irish and British emotionally and logically of course, but for revenue purposes and law , NI is currently a British province, provisional only in terms of future referendum. We Irish should not therefore, be taking responsibility for business we have little or no ultimate control over, and benefit little to nothing from. The British or others should be taking that responsibility. Was it really a Irish pork crisis? No it was a British sourced contamination, just like mad cow disease was British in origin. Just like foot and mouth has always been British sourced in any Irish outbreak. Sure most or enough people will eventually forget about those other border companies involved with horse meat trading. But it will be the Irish brand left damaged, and perversely often multi nationals (many based in NI and Britain) who are able to benefit from the lost Irish business and thousands of jobs. That supposed Irish pork crisis which is now considered a British sourced problem. A good example why Tyrone based multi national (not Irish) business such as Moy park chicken and others like them, must not be allowed to take advantage without any risk. When the public do not ask many or any questions and state bodies like Bord Bia naively encourage the cynical use of Ireland. What goes on in Ireland is currently a win win for these foreign companies. Irish foods somewhat remarkably, still have a good name despite the inept politicians who are a collective shambled disgrace. You can tell the good name of Irish brand foods for a fact, when so many NI business are selectively happy to be 100% Irish, as it pays. Irish Politicians must start doing their job for Ireland, not taking bows or hits on behalf of what ever big business PR, who might have offered a few token jobs here or brown envelopes there.